Nibs.com flex modification on a Pelikan? Thread: Nibs.com flex modification on a Pelikan? Just wondering if any of you have had the "added flex" option done by nibs.com (or elsewhere) and what your impressions are. The nib doesn't need to be super flexy, just a nice bounce with some line variation. Re: Nibs.com flex modification on a Pelikan? 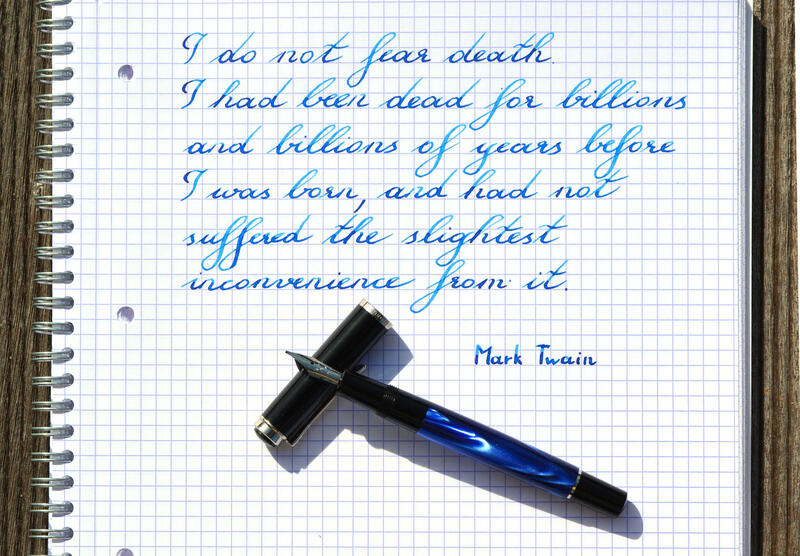 I bought my M700 B at the 2011 Ohio Pen Show and walked it over to a nibmeister who ground it to a cursive italic. I really like writing with that pen, and I would "CI" it again. Of course, it all depends on the skill of the nibmeister. Fred, how does the 700 compare size-wise to a vintage 400? I have a 400 tortoise that I really enjoy using. Of course, my other workhorse pen is a 146 from the late 80s which I enjoy the size of and appears to be in the 900 range, lengthwise. Depends on how much you want and John will mod for you. I have some of his with a more than semi flex to full flex to almost noodle. Seem to recall hearing that John was only working on nibs in pens sold through nibs.com due to long backlogs. You might check his website to be sure. Adding flex to a Pelikan nib is definitely possible. I do not have experience of buying a modified one, but I´ve modified one by myself. 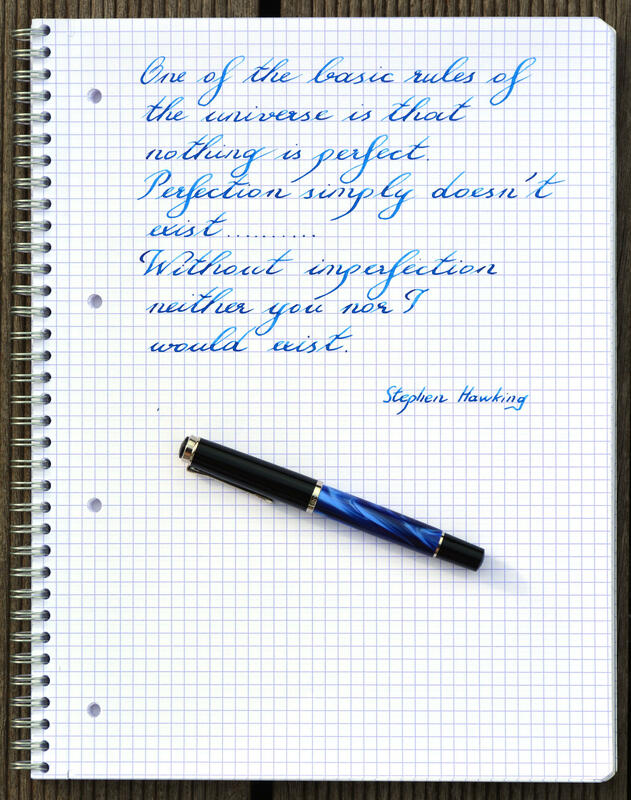 I´ve started with a B nib as base and EMF modded the nib and gave it also a CI like grind. From flex perspective my tinker nib is now in the full flex range, not on the upper border towards a super flex, but definitely more than semi-flex. The feed keeps up astonishing well, I didn´t have to change it. Wow. Nice work, Ptero! Is this the same EMF work that you did on the Noodler's? Tinkering with a steel nib isn't nearly as terrifying to me as with a gold one. If this little scheme comes together, I might just go with a CI grind on the nib, since I already have a flexible 400 and a pretty nice semi-flex 120 (M&K). Or get the Toledo 700 and have a stock of nibs around to play with. It’s similar to the EMF, or better see it that way that Iˋve used the experience I collected there. As the Pelikan nibs has no long nib slit most of the flex has to come from the section with the nib slit. So I made the tines slimmer and tried raise the point where the curvature changes as far up as I could (the point where the nib has its broadest point, we might also could name it shoulder). Additional I made it also a slight bit slimmer in the section above, as I felt that this would help to give a little bit extra flex (but only minor). The process was divided in several steps, made a little change, try how it feels (and looks). I did not changed the thickness of the nib as I read that some nib Meisters do. Such a change is imo a little bit tricky, as you should do it homogeneous over the whole surface (would mean I lot of spot measurements in my eyes). I´m not sure which tools they use to ensure this, or they just do it over the thumb. Also I would been concerned about roughing the surface (on the lower side) and how this might affect the ink flow. But as you can see modifying the thickness is not really needed to achieve a nice amount of flex (additional the italic grind helps to make it even more expressive). You are right, I also would think twice before doing it with a gold nib. I bought this pen especially for the project, also because steel Pelikan nibs are easy to get and in case the mod fails the financial loss is minor. I have a Sailor 1911 mid that was flex modified by Mottishaw's place. It's beautiful to write with - almost brush-like - but the nib is small and it's pretty flexible so you have to be careful with it. I won't push it too far because I know it will spring and the tines can be fiddly. No issues with the feed keeping up though it only writes from about a Japanese fine to a broad. If you had this done on a larger nib, I don't think it would be nearly as delicate. If I had it to do again, I would have a 3776 modified instead and may do just that soon. I got John's Spencerian on a Pilot 912 a couple weeks ago. If I were in your shoes, Jon, I'd do exactly as Fred suggested. Absolutely. That the Toledo M700 is a 4xx size pen makes that the more attractive option. Ever since you mentioned them on Reddit, I've been just staring at pictures of them. I will be stopping in at Fritz-Schimpf in Tübingen to see what they have. I already enjoy other 4xx sized pens, but the allure of the bigger one was strong. Knowing that I can drop vintage nibs into the 700, though, has changed my mind.